India has a Big Government not because there are too many people working for it, but because in the period of more than seven decades after independence, the government has tried to do way too many things and made a mess of most. Take the case of public sector enterprises. The central government majorly owns and runs more than 300 public sector enterprises. In 1951, there were just five public sector enterprises. Over the years, the numbers kept increasing as the government kept entering more and more businesses. Of course, given that it had no expertise in operating in these businesses, it ended up making losses. Even in cases it didn't make losses, given the return on capital employed that the government earned, it did not make much sense of continuing to be in business. But governments enter businesses, they never leave them. Take a look at Table 1. 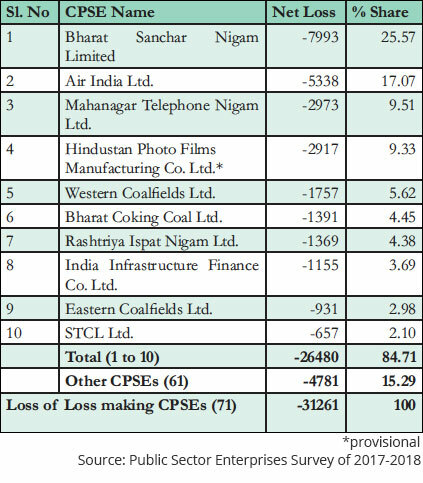 It lists the top 10, loss-making public-sector enterprises in the country in 2017-2018. Table 1: Losses, losses and more losses. Table 1 makes for a very interesting reading. The telecom sector has been taken over by the private sector, but the government continues to have a token presence in the sector. And this token presence cost the country close to Rs 11,000 crore in 2017-2018. Let's look at this issue pointwise in greater detail. 1) In fact, things get even more interesting when we look beyond the top 10 loss making companies. In 2017-2018, there were 71 public sector enterprises which incurred losses. The total losses of these companies amounted to Rs 31,261 crore. 2) What this tells us is that the top 10 loss making companies make up for the bulk of the losses of the loss-making public-sector enterprises. 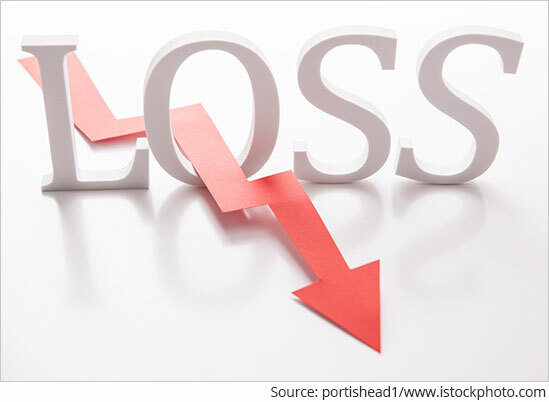 The losses of the top 3 loss-making companies, BSNL, Air India and MTNL, make up for 52% of the losses. If the idea is to stop overall bleeding, the government knows where to start. 3) The interesting thing is that there are 52 companies which have made losses in 2015-2016, 2016-2017 and 2017-2018, respectively. Hence, a large chunk of loss-making companies make losses every year. This happens primarily because they are not in a position to compete, with their business models being clearly unviable. In a recent answer to a question raised in the Lok Sabha, the government offered reasons for the losses faced by the public sector enterprises. As it said: "Some common problems faced by loss making CPSEs include obsolete plants and machinery, heavy interest burden, resource crunch, low capacity utilization, low productivity, surplus manpower, high input cost, non-remunerative prices etc." Every practical reason that one can think of any business being unviable has been offered here. But the businesses continue to operate. 4) The list of the loss making companies makes for an interesting reading. (You can check it out here). The government is present in sectors like biofuel, airlines, telecom, paper, steel, drugs, hotels, watches, machine tools, newsprint, pumps and compressors, bearings, limestone, organic chemicals etc. Not surprisingly, all these companies make losses every year. The government doesn't have the swiftness and the nimbleness to compete with private firms operating in these sectors. At the same time, the zeal of a private entrepreneur to make things work, can never be found in a manager working on a government salary. Most of these public sector enterprises are remnants of another era. Given that, they need to be treated accordingly and done away with. 5) The interesting thing is that this list of 52 loss making companies does not include 21 public sector banks, which have been bleeding money. The total losses of public sector banks in 2017-2018 stood at Rs 85,371 crore. 6) It takes a lot of money to keep these public sector enterprises going. In many cases, the companies borrow every year in order to continue operating. Of course, given that these companies are perpetually loss making there is no way they are going to repay this money. Take the case of Hindustan Photo Films, it has accumulated a debt of close to Rs 14,000 crore, over the years. Of this, banks have lent more than Rs 11,300 crore. Why would any bank continue to lend to a company which hasn't done any business in years, and is unlikely to be able to earn a profit to repay the money? The answer lies in the fact that Hindustan Photo Films is ultimately owned by the government and governments don't default on their debt. Basically, most of these loss making companies continue to operate by borrowing every year and using that borrowing to repay the previous borrowing. A perfect Ponzi scheme, if ever there was one. And they are able to borrow because they get treated like the government when it comes to borrowing. While, this borrowing doesn't always show up in the expenditure of the government, and hence, its fiscal deficit, it does add to the overall liabilities of the government and the country. Fiscal deficit is the difference between what a government earns and what it spends. 7) In case of banks, between April 2013 and December 2018, a total of Rs 2,16,900 crore had been invested by the government in these banks. In fact, by the end of March 2019, the government would have invested a total of Rs 2,71,367 crore in these banks. In 2017-2018 and 2018-2019, the government will end up spending a total of Rs 1,96,000 crore to recapitalise public sector banks. Of course, all this money being invested in these banks, is money being taken away from other important things. So, as I keep saying, there is no free lunch in economics. 8) The 52 perpetually loss-making companies continue to operate, and in the process continue to drag down the Indian economy. The amount of capital locked up in these companies and many other public sector enterprises, which barely make any money, continues to be huge. This money could easily be put to better use. But of course, no government has had the balls to shutdown these companies or sell them. So, we the taxpayers, continue to bail them out year in and year out. We request your view! Post a comment on "The Tale of 52 Public Sector Enterprises Which Lose Money Every Year". Thank you for posting your view! 5 Responses to "The Tale of 52 Public Sector Enterprises Which Lose Money Every Year"
I think Govt should make a revival plan for all loss making PSE from a international consultancy firm..If plan didnt work out for 3 yrs the shut the PSEs except banks sale off their machines,lands etc and money come should be invested in annuity plans of LIC on behalf of employees below BOD rank to give them regular salary till their retirement and Govt can make use of them in their depts or other PSEs as per capabilities. Loans on balance sheet should be taken by CG or SG as case maybe. Other PSUs can be asked to pay off these loans instead of giving divident to CG or individuals/Private firms with spl. focus on FIIs NRI Foreign companies can be asked to pay loans on the benefit of Income tax exemptions like 110% of amount paid. For Banks govt should consolidate all banks into 4 banks..2 for Industrial, business purpose & infra purpose for loang term finacing basically and 2 for retail financing with no closure of branches in rural India..for employees same annunity method can be followed Basic issue I feel with closure of PSUs is what about employees? Govt has moral responsibilty to offer them job security and salary but issue is govt not fit in all business so they should take one time jolt on their fiscal deficit instead of keep making problem worse. For futures plans should be to make management more of professionals..most of PSUs has IAS, IFS, politicians on the board who lack any management experience. Most of decision making authority should be with professionals. As I have always written to you , the PSUs are under loss not due to their inability to do business. It is because of the intervention of bureaucrats and crony capitalists corrupting the PSU managements. Even then put together the loss is not more than the loss due to the private sector defaulting on loans ( NPAs of PSU banks). There also the government is stepping in and saves the bank(!). In fact, it is not saving the bank, it is saving the defaulted company. In reality, the government is saving wherever rich people default and save poor people only when election comes. But I agree with you that always there is scope for improvement and PSUs have to improve a lot. A very good, brief and concise article on the state of our PSE. In the past 5 years, out of the nearly 300 PSE, 22 (7%) have been shut down and 11(4%) of them have been privatised (though 6 of the hotels among them have been sold of to State Governments). From an overall loss point of view, this may not be substantial savings, still in the right direction of closure of loss making PSE.